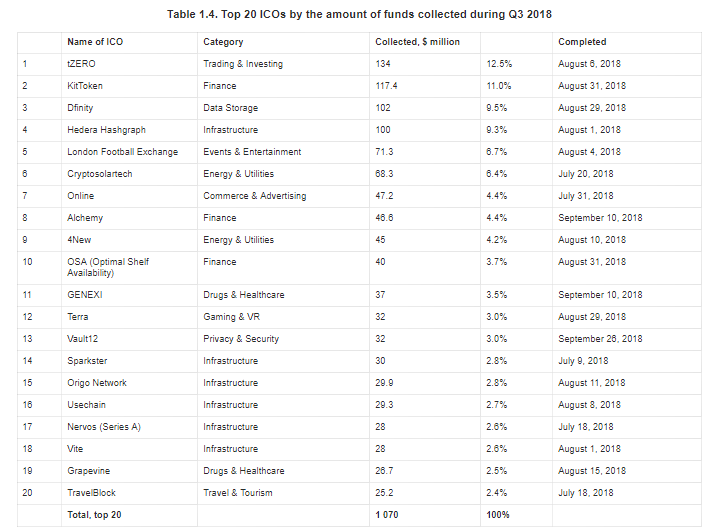 The third quarter of 2018 was not as successful for ICOs as the first and second quarters. Nevertheless, the total amount of funds collected exceeded $2.4 billion. In this regard, the 20 largest ICOs accounted for more than 40% of this amount, which represents around $1 billion in total. At least, that’s what a new report covering data on ICO market movements in Q3 2018 says. An index carried out by top experts in the field. Among them we can find professor Dmitrii Kornilov, Doctor of Economics, Member of the Russian Academy of Natural Sciences, and Leading Analyst at ICOBox; Dima Zaitsev, PhD in Economics, Head of International Public Relations and Business Analytics Department Chief at ICOBox; Nick Evdokimov, Co-Founder of ICOBox; Anar Babaev, Co-Founder of ICOBox; Daria Generalova, Co-Founder of ICOBox. The index was first published on coinspeaker. According to the popular site and citing the report, a total of 600 ICOs were completed during Q3 2018. The portal Icobench.com alone shows 525 completed projects for the period from July 1-September 30. This same website also shows more than 240 projects that are scheduled to start after October 1, 2018. Despite the high risk of placing funds in ICOs, the statements of many publications on the existence of numerous fraudulent projects, and the depreciation in the prices of the tokens of many projects, this area continues to develop in anticipation of positive changes on the cryptocurrency market. Some ICOs issuing new tokens are in fact concealed offers of securities, which could be dangerous for backers. Due to the absence of clear legislative and regulatory principles on ICOs in most countries, ICO participants encounter new difficulties and possibilities. Yet, nevertheless, the third quarter was rich in interesting events and large ICOs. For example, the leader by funds collected in the third quarter was the tZERO project, which is a subsidiary of the Blockstain Overstock.com company. tZERO collected $134 million. The project was launched on December 18, 2017, and was developed to meet SEC requirements. tZERO is the first alternative trading system for cryptographic tokens that the US Securities and Exchange Commission (SEC) assigns to the category of securities. The goal was to collect $250 million. However, and citing information from a press release, the funds collected by tZERO equaled $134 million. GSR Capital will subsequently purchase a share in the project worth $270 million when the company’s capitalization reaches $1.5 billion. To recap, during the third quarter of 2018 more than $2.4 billion were collected (this amount includes 197 ICOs). However, due to the fall in total capitalization of the cryptocurrency market since the start of 2018, the adjustment has crossed over to ICOs as well. This is leading to a steady fall in the hard cap requirements of projects, a drop in the effectiveness of fund collection, and many projects are not disclosing data on the amount of funds collected on their official websites. “The future effectiveness of ICOs will depend directly on the change in cryptocurrency market capitalization, as well as on the formation of legislative norms for holding ICOs in the countries of the European Union, the USA, Japan, South Korea, UAE, and, of course, China,” stated at coinspeaker.